Rev. Eugen J. Pentiuc, Archbishop Professor of Biblical Studies and Christian Origins, joined Holy Cross in 1998 and became tenured professor of Old Testament and Semitic languages in 2009. His work concentrates on two areas: Christian Bible, text and interpretation, as well as Semitic languages and civilizations. Fr. Pentiuc’s current research focuses on the Bible reception and interpretation in Orthodox Christianity (Eastern/Byzantine and Oriental), more specifically the discursive (i.e., patristic commentaries) and imagistic (i.e., liturgical media: aural [hymnography, lectionaries, homilies] and visual [iconography, liturgical acts]) modes of interpretation. Fr. 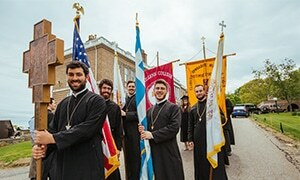 Eugen is currently working on a new book under contract with Oxford University Press, titled Hearing and Seeing the Scriptures: Liturgical Exegesis of the Old Testament in Eastern Orthodox Tradition, seeking to identify some of the hermeneutical procedures at work in so-called “liturgical exegesis” of the Bible. The Book of Prophet Hosea: Introduction, Translation and Commentary (in Romanian) (Bucharest: Albatros, 2001). West Semitic Vocabulary in the Akkadian Texts from Emar (Harvard Semitic Studies 49. Winona Lake, IN: Eisenbrauns, 2001). Long-Suffering Love: A Commentary on Hosea with Patristic Annotations (Brookline, MA: Holy Cross Press, 2002; 3rd impression, 2008). Fear of Real (in Romanian) (Bucharest: Cartea Romaneasca, 2003). Jesus the Messiah in the Hebrew Bible (New York / Mahwah, N.J.: Paulist Press, 2006). Romanian Translation: Iisus Mesia in Biblia Ebraica (Bucharest: Basilica Romanian Patriarchate Press, 2016). The Old Testament in Eastern Orthodox Tradition. New York: Oxford University Press, 2014). Romanian Translation: Vechiul Testament in Traditia Ortodoxa Rasariteana (Cluj-Napoca: Renasterea Press, 2018). Hosea: The Word of the LORD that Happened to Hosea, et al. (The Bible in Its Traditions 3. Under the direction of Olivier-Thomas Venard, O.P. École Biblique et Archéologique Française de Jérusalem. Leuven: Peeters Publishers, 2017).